Sukakpak mountain is one of the famous mountains visible along the James Dalton highway road corridor in Alaska’s Brooks Range mountains. The mountain can be seen from many angles which makes it appear like a completely different mountain given the radical change in appearance depending on the angle of view. next » | 160 sample images from this category. Try a keyword search to see them all. Koyukuk River and mount Sukakpak, Brooks Range, Arctic, Alaska. 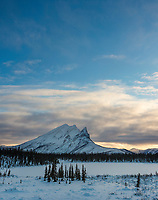 Winter landscape of mount Sukakpak of the Brooks Range mountains, Alaska. Snow covered mt Sukakpak, Brooks Range, Alaska. Trans Alaska oil pipeline traverses the tundra in Alaska's Arctic. James dalton highway, Brooks Range mountains, Arctic, Alaska. Mount Sukakpak of the Brooks Range mountains in Alaska's Arctic. Mt Sukakpak of the Brooks Range. Balsam poplar trees and mount Sukakpak, Brooks Range, Alaska. Trans Alaska oil pipeline and Mt. Sukakpak, Brooks Range, Alaska. Truck drives the James Dalton Highway by mount Sukakpak in Alaska's Arctic. Mount Sukakpak, Koyukuk River, Brooks Range, Alaska. Mt Sukakpak of the Brooks Range mountains, Arctic, Alaska. Winter camp under full moon light. Photographer, mount Sukakpak, Koyukuk River, Brooks Range, Alaska. Mount Sukakpak, Koyukuk River, Arctic, Alaska. Mount Sukakpak and the Koyukuk River, Brooks Range, Arctic, Alaska.